Latest News | Country Builders Bank Inc.
From left to right: Hiyasmin Ibaite (Branch Manager of CBB Lower Bicutan), Ronel Sosa (ATM customer) and Jimmy Ang (Vice President-Marketing Head of CBB). CBB (Lower Bicutan) – It’s a textbook hypothetical scenario, you are looking for an ATM terminal to make a withdrawal and as you are about to insert your ATM card, you saw several pieces of One Thousand Peso (P 1,000.00) bills lying at the ATM’s cash dispenser. Do you keep it, or turn it over to the bank? 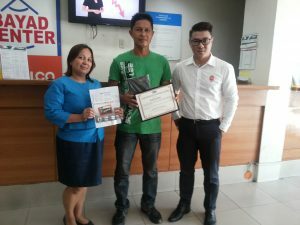 The choice was easy for Mr. Ronel Sosa who found Ten Thousand Pesos (P 10,000.00) last April 12, 2017 at Country Builders Bank’s ATM located at Lower Bicutan, Paranaque City. A month before the incident, Mr. Ronel Sosa was laid off from work due to cost cutting. As much as he needed the money to support the daily expenses of his family, he did not think twice to return the money that is not his… he said “inisip ko na baka yung nakaiwan ng pera na yan ay may pinaglalaanang importanteng gastusin kaya di ako nagdalawang isip na isauli sa bangko yung nakita kong pera”. Mr. Ronel Sosa saw ten pieces of One Thousand Peso (P 1,000.00) bills or a total of Ten Thousand Pesos (P 10,000.00) at the ATM cash dispenser around six o’ clock in the morning while the bank was still closed. He went home with the money and went back the same day at nine o’ clock in the morning to Country Builders Bank Lower Bicutan branch to return the money he found at the ATM terminal. This is a very inspiring story worth sharing… that despite the hardships of life, we can still find Good Samaritans. Filipinos like Mr. Ronel Sosa is what makes our country great!